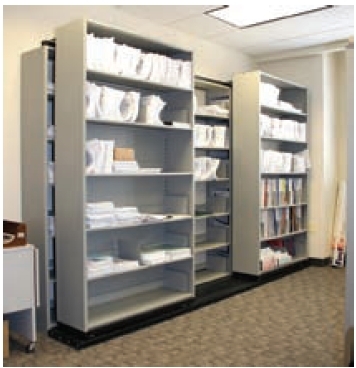 Allied Systems Products can help maximize your filing space with a Side to Side shelving system. Imagine two or three rows of storage at your fingertips. The Side to Side shelving system has a stationary back row and either one or two rows in the front that move from left to right. A two row letter size system is only 26 1/2" deep and the two row legal size is 32 1/2" deep. These shelving systems can be configured to meet almost any floor size. The Side to Side shelving system is easy to use and can grow with your business. if you have any further questions about the Side to Side shelving system or would like to get a quote, please contact one of our sales staff. Click here to see all the colors that are available with the side to side shelving unit.